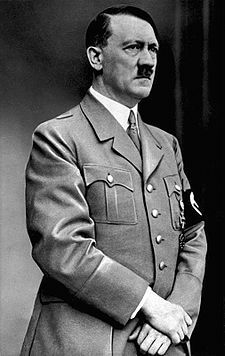 Adolf Hitler was an Austrian-born German politician and the leader of the National Socialist German Workers Party (German: Nationalsozialistische Deutsche Arbeiterpartei, abbreviated NSDAP), commonly known as the Nazi Party. He was Chancellor of Germany from 1933 to 1945 and, after 1934, also head of state as Führer und Reichskanzler, ruling the country as an absolute dictator. A decorated veteran of World War I, Hitler joined the precursor of the Nazi Party (DAP) in 1919 and became leader of NSDAP in 1921. He attempted a failed coup called the Beer Hall Putsch in Munich in 1923, for which he was imprisoned. Following his imprisonment, in which he wrote his book, Mein Kampf, he gained support by promoting German nationalism, anti-semitism, anti-capitalism, and anti-communism with charismatic oratory and propaganda. He was appointed chancellor in 1933, and quickly transformed the Weimar Republic into the Third Reich, a single-party dictatorship based on the totalitarian and autocratic ideals of national socialism. Within three years, Germany and the Axis powers had occupied most of Europe, and most of Northern Africa, East and Southeast Asia and the Pacific Ocean. However, with the reversal of the Nazi invasion of the Soviet Union, the Allies gained the upper hand from 1942 onwards. By 1945, Allied armies had invaded German-held Europe from all sides. Nazi forces engaged in numerous violent acts during the war, including the systematic murder of as many as 17 million civilians, including an estimated six million Jews targeted in the Holocaust and between 500,000 and 1,500,000 Roma, Poles, Soviet civilians, Soviet prisoners of war, people with disabilities, homosexuals, Jehovah's Witnesses, and other political and religious opponents. In the final days of the war, during the Battle of Berlin in 1945, Hitler married his long-time mistress Eva Braun and, to avoid capture by Soviet forces less than two days later, the two committed suicide on 30 April 1945.